No More Classes Until October 15!! It’s been a fantastic season, starting out slow on the heels of Odile… we did our first classes last October out of my home kitchen with an ice box, feeling very much like we’d slipped through a time warp back into the old Cabo,,, Ten months and a whole bunch of construction later, the Casa de Colores is better than ever with a brand new metal structure roof and gigantic deck, plus a whole lot more. 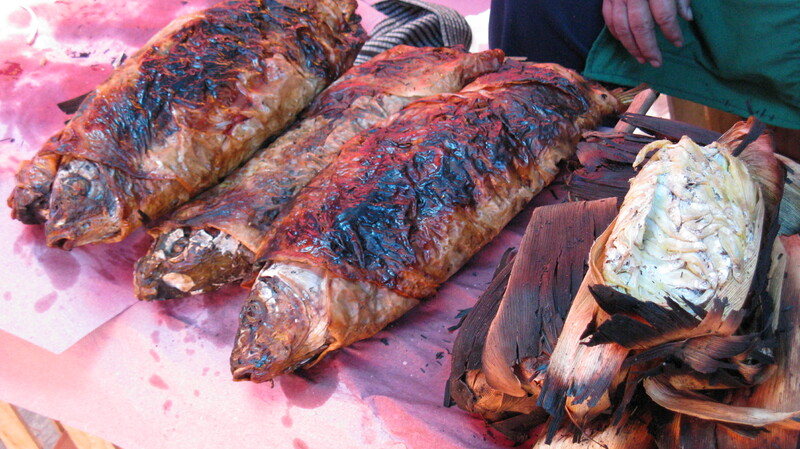 I will be in Mexico City with Manuel as of Sunday, crawling through South Central Mexico’s legendary traditional markets like the one shown above. .
It’s Tlaxcala’s thousand year old pre-Hispanic market, and these tamales are sold by ancestors of the original vendors… still made from lake fish stuffed with tiny lake fish, wrapped in the inner membrane of the cactus tequila is made from–mixiote–then charred directly in glowing coals until cooked to smoky perfection. Such a shock to first world eyes to see not only pre-Hispanic, but pre-HISTORIC cooking still going on in Mexico, like the ancient recipe for stone soup, cooked by adding hot rocks to each bowl! I turn 60 in October, and Manuel will be 64. As he is a huge Beatles fan, it has to be a major celebration–we’re thinking Cuba, or possibly Chiapas/Guatemala… stay tuned. In any case we will be crawling through markets collecting ideas and ingredients for my seventh season, which will begin on October 15th. Hope to see you there. Have a great summer, and keep cooking MEXICAN! MOST places on the planet, a totopo is the chip you dip in your salsa or guacamole. 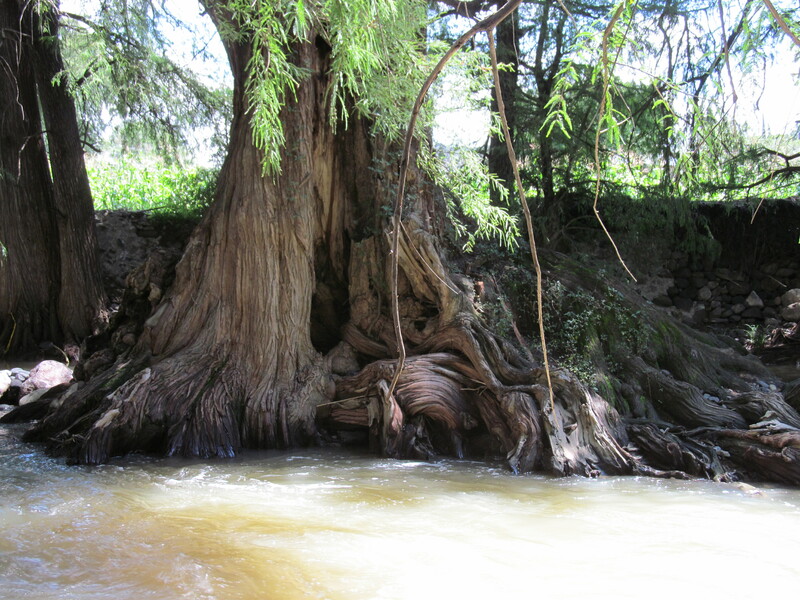 In Tezoatlan, tucked away in the Lower Mixtec Mountains of northern Oaxaca, a totopo is something else altogether. For generations this gigantic, paper thin bread made from freshly ground nixtamal (field corn prepared with slaked lime the way it’s been done for over a thousand years), fresh lard and a pinch of salt, was carried by mule drivers carrying goods to ranches and settlements that seldom made it to a town of any size to buy the basics. They carried totopos, which look fragile, but are cooked to a point of flexibility that, when reheated on a comal or over an open fire, attain a perfect crisp, crunchy texture that is uniquely satisfying. Along with dried salsas that could be rehydrated with a little water and dried meats made palatable by simmering in the same salsa, plus whatever greens and fresh meats that could be gathered along the trail, the hardy mule drivers ate pretty well without carrying a lot of extra weight. Tezoatlan’s totopos are a local addiction, part of everyone’s daily diet in this magically beautiful village of the Lower Mixtec. My guy Manuel was born and raised there, in the building where his father had an electric mill used to grind fresh nixtamal carried in by local women daily in five gallon buckets. 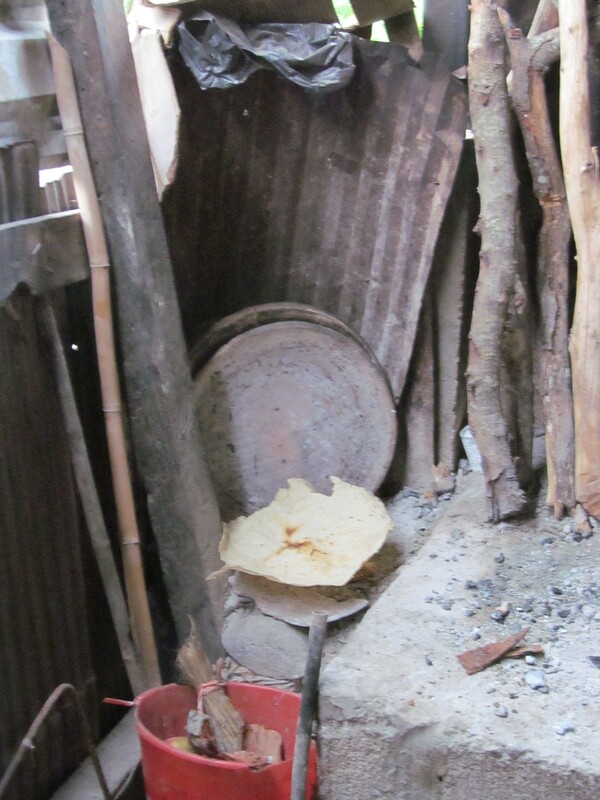 The mill had stone discs inside which had to be chiseled on a regular basis to make stone ground, whole grain masa for tortillas, tamales and other antojitos and, of course, for totopos. DOÑA Filiberta is one of two women in Tezoatlan who are still making tototopos, although age and arthritis have slowed her down considerably. Manuel (along with plenty of Tezoatlan’s townspeople, no doubt) has long been concerned about the future of their favorite oversized cracker… but we can all relax after our visit to her kitchen workshop in September when she assured us that her grandaughter is learning the trade and will be taking over this important work. 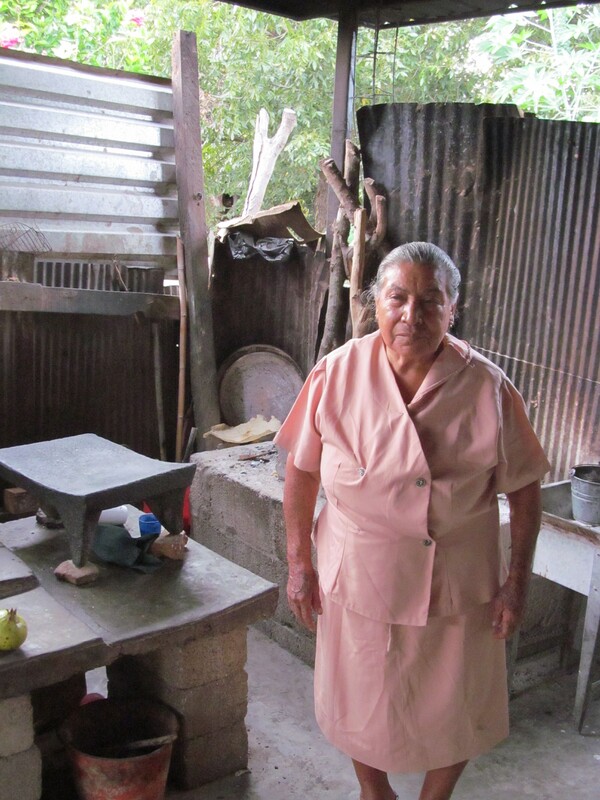 The photo at the top shows Doña Fili’s old fashioned, thin pottery comales (griddles) upon which her totopos (also shown) bake over a hardwood fire, just as they have always been. The second shot features Doña Fili herself, with the stone metate still used to grind nixtamal. She also has a small stone mill similar to the one Manuel’s father used in the family business, and she still remembers him fondly. She says he was a kind man who always provided hot water for the women to wash their hands on brisk Mixtec mornings. Mexico’s food traditions are the glue that hold its people together. 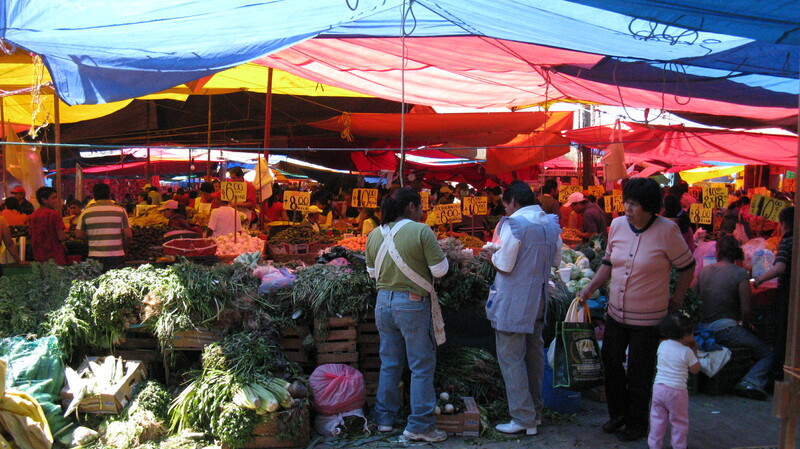 I hope you can take a trip someday to small town Oaxaca where you will see and taste exactly what I mean!